Last look at the Stevenage show today. As usual these days, there were a few layouts of locomotive sheds and stabling points on show. It must be that we all own too many locomotives! Leeman Street in P4 models the sidings at one end of York MPD, with the station roof prominent on the backscene. There are only two points and a turntable on the layout. This layout wasn’t in the exhibition guide, and must have been a late stand-in. Not complete, but an interesting model of an ex-LMS MPD in British Railways days. And with some attractive steam locomotives on display. Laramie Engine Terminal again models just part of an MPD. With O gauge ‘Big Boy’ locomotives to show off, part is probably all one has room for. No points and just the turntable here, and operation was just the fuelling, watering and turning of the locomotives. But what a locomotive! 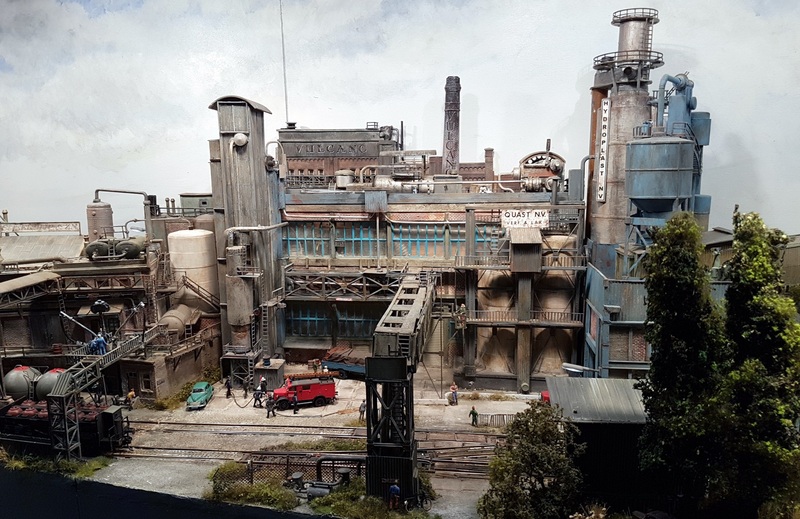 Copenhagen Fields has been around, and being constructed, for over 30 years, but still remains a tour-de-force of 2mm fine scale modelling. The last (I think) section of the layout is the goods yard, that nears completion below. The depth of the urban area scenery is achieved by reducing the scale of the buildings as one approaches the backscene. These are some of the earlier areas of the model, and it is noticeable how some of the grass has faded – but it’s not bad for a mid-summer drought. Perhaps when the model is finished, a little ‘freshening’ of the older areas is needed. It’s good to see Trevor Nunn back exhibiting with an ‘S’ gauge layout. His model of Kings Lynn on the GER was a fine model and Trowland, a tiny and imaginary branch terminus on the M&GN looks just as good. The layout plan bears some similarity to Iain Rice’s ‘Buttley Mills’ layout. Moving on to a couple of industrial layouts. 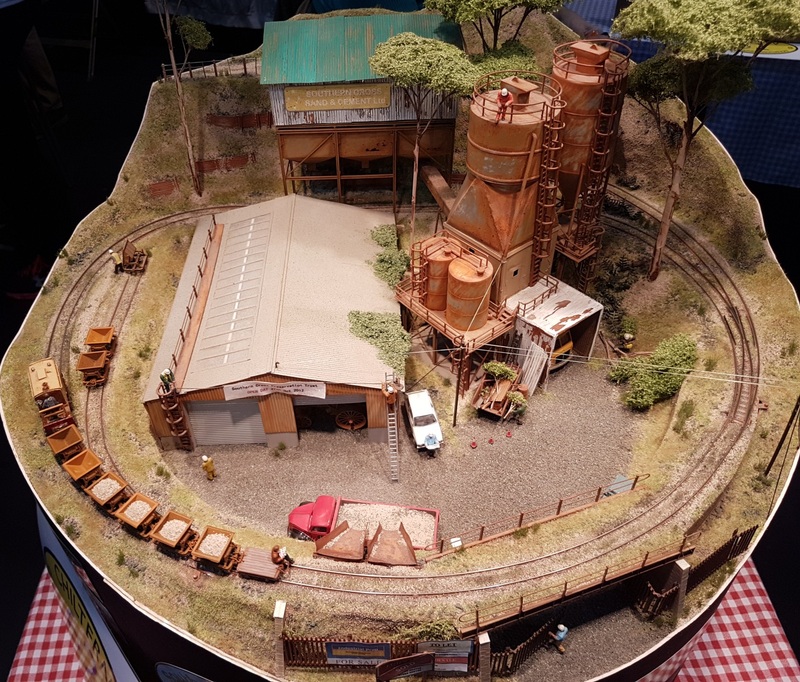 The Southern Cross Preservation Trust, a 2′ diameter 009 layout, shows what once can do in no space at all. Not much operation on a pizza layout, but masses of detail. Finally, Smeerdijk, an HO layout set in Holland. 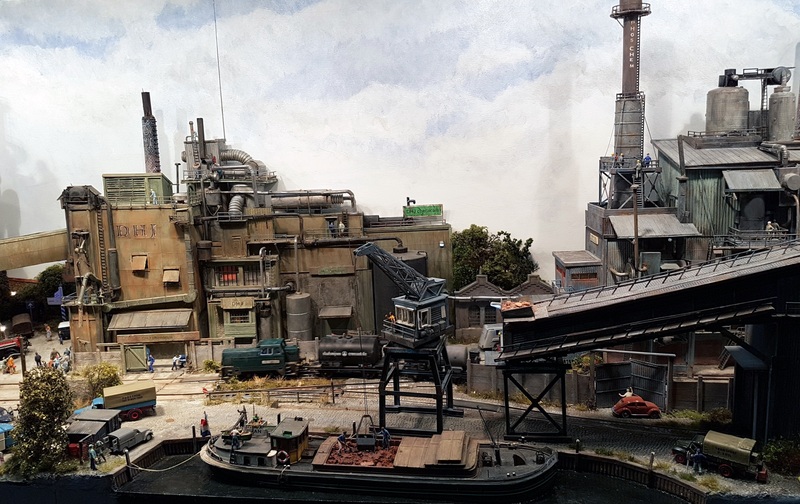 There couldn’t have been much left in the scrap box having completed the layout, but you can look at this industrial landscape for ages. So that’s the Chiltern show blogged through. Apologies to the other fine layouts that I haven’t described, but these were the ones that caught my eye. 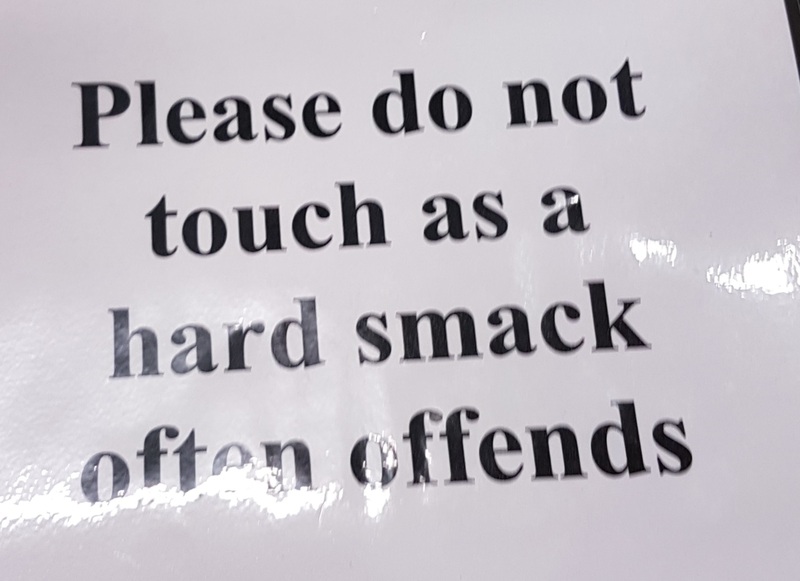 We’ll leave with this notice on one stand. Definitely non-PC, but I like it! This entry was posted in Exhibitions, Inspiration, Out and about and tagged exhibition, inspiration, N gauge. Bookmark the permalink.